Performers include: Ashton Kutcher, Danny Masterson, Sam Elliot, Debra Winger, Grady Lee Richmond, Laura Vallejo, Elisha Cuthbert, Bret Harrison, and Kelli Goss. A sitcom set in Garrison, Colorado, The Ranch follows the dysfunctional Bennett family on their Iron River Ranch. Each season of 20 episodes is split into two 10-episode parts, and Netflix primarily ignores season numbering entirely, by using the sequential “part” numbers, instead. The multi-camera comedy centers Colt (Kutcher). After a fifteen year absence, including a short, failed semi-pro football career, Colt returns home to help his big brother Jameson “Rooster” (Masterson) and father Beau (Elliott) run the ranch. Maggie (Winger) is Colt and Rooster’s mother and owns the local bar. A free-spirit who also grows weed, Maggie is separated from Beau and lives in a trailer behind her business. Rooster is the son who remained home and worked the family business, while his big shot brother was off living it up, so there is tension between them, when Colt returns. The two do have some things in common — particularly drinking and womanizing. A prickly, Vietnam Vet, Beau has run the ranch since the death of his own father. Politicians aggravate him just about as much as his sons’ irresponsible tendencies. The series highlights these flawed people’s relationships with one another as well as with the other people in their lives. What do you think? Do you like The Ranch TV show? Should it be cancelled or renewed for another season on Netflix? 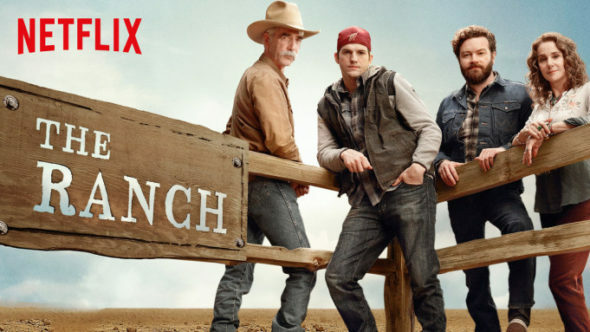 The Ranch: Is the Netflix TV Show Cancelled or Renewed for Part Four? Used to be a great original comedy, now it’s just a predictable and boring drama. Bring back Rooster and bring back the comedy. Please don’t cancel the show. Love it. Don’t cancel…love this show!!! Have Rooster come home, not be dead. Love the cast and the guest appearances were cool. Really great series, please renew!!! Don’t cancel! We love this show and the cast. LOVE this show, please renew!! Please DO NOT cancel this show. It’s so good. It’s real, it’s modern day and look at all of the actors that are getting working on it. Not to mention a large crew of all the people it takes to produce something like this. Do us all a favor and keep it going. Please leave the show on the air. It captures your interest and then you are hooked. Bring back Rooster (you’re innocent until proven guilty). He added to the show. Stellar acting. Needs less f bombs – older women dropping F bombs all the time is not believable. The acting is so good I cried at moments and that is a rarity. Love all the guest appearances.Replace Debra Winger with someone a bit more effervescent…Goldie Hawn? Keep the show: cancel the laugh track. I started watching and turned it off after a few minutes. The laugh track drove me away. Don’t cancel the show! It keeps getting better and better! I don’t really sit & watch TV, don’t have time, but I am ADDICTED to The Ranch! I can sit & “binge watch” then start over… I hope it stays on Netflix, about the show I’ve seen in a while…. Kudo’s to the cast, writers, directors, on a great job. Great show! Modern day ALL IN THE FAMILY?? — Archie Bunker LIVES ON!